In the 1860s, Black Codes, including vagrancy and loitering laws, were established to prevent black people, particularly black men, from coming together. These Black Codes were used to vilify and cement a distinct and racial wedge between black people and their supposed new freedoms. Fast-forward to the present and this blockade continues to exist—albeit in a different form. Currently, 2 percent of the nation’s teachers are black male educators. Just 2 percent. This means in most schools across America, black male educators rarely find themselves in shared spaces. 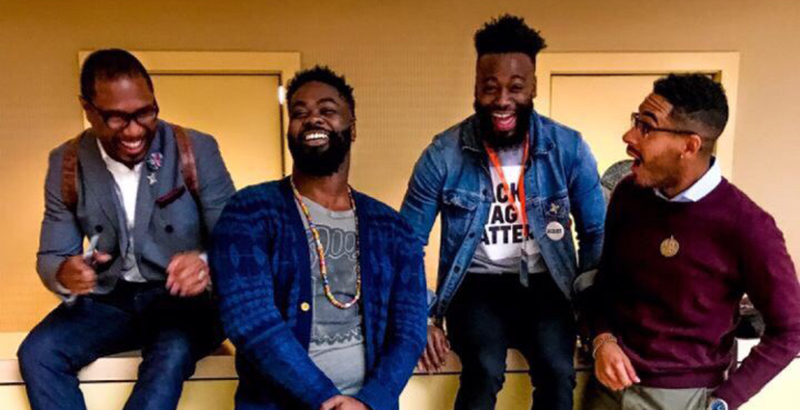 This is what The Fellowship — Black Male Educators for Social Justice seeks to do: Despite the obstacles, convene black male educators from across the country for professional development and community building. We also advocate for the few black men who are leading classrooms and schools and work to address the “leaky pipeline.” The pathway to leading a classroom is fraught with obstacles and leaks: high concentrations of black males in poorly performing K-12 schools, low graduation rates, lack of college readiness by too many graduates, challenges to passing teacher certification exams, low retention rates, etc. Our organization was created to address these leaks, in a concerted effort to retain these critically important black male educators. The Fellowship hosted its second annual convening in Philadelphia in October this year with more than 1,100 attendees across 35 states. Our Black Male Educators Convenings (BMEC), both regional and our annual national convenings, help to bolster those efforts. For the past two years, being able to scan the room and see such a powerful assemblage of black men gathered in unison, with common goals, aspirations, backgrounds, and challenges, was an emotional and spiritual moment for me that continues to resonate — something I carry with me well beyond the Convening. We all acknowledged how rare it is to see this many black men in one gathering — particularly to talk about schools, students, and education — far too rare. At one time, it would have been illegal to hold such a gathering. Today, it is special, because black men aren’t always asked to contribute or be provided with the platform to elevate their voices as they champion our school communities. For the black men (and women) with whom I debriefed, it’s more than professional development — it’s a moving affirmation of a community coming together in a shared calling. The Fellowship — Black Male Educators for Social Justice was founded because a group of black men in Philly wanted to lift each other up, support each other, and draw from experiences and problem-solve challenges as a collective. It was a support group but also a grassroots retention effort; we know that teachers of color often bear an unbelievable and frequently crushing “invisible tax” as they seek to serve their communities. This additional burden as the single black male teacher can lead to higher attrition rates; in fact, several of the founding members of our organization initially had thoughts of resigning from their roles. Over the course of a year, we met over dinner and discussed our vision for expanding. We each had friends who were struggling in schools as the only and lonely black male teacher and could benefit from our network of 17 unified black male educators. Originally, a national or regional conference was hardly the thought or idea, but there were some specific influencers that led us to determine that convening black male teachers, principals, and other educators could serve as a powerful professional development opportunity that addressed issues that black people spoke about and wanted but found rare in school and district offerings. After speaking with several black male educators, one theme that we continued to hear over and over again was that black men are tired of serving as the disciplinarian. Black men who were leading classrooms would share how they were being coaxed into disciplinary roles, yet they wanted to focus on teaching. Black men with great classroom management would serve as the “buddy teacher” for multiple white women — essentially taking their “challenging black kids” anytime the teacher needed a break. The sending teacher found they could be even more “effective” without those students, their ratings increased, and they later would become supervisors giving the black man directions on classroom management. The very classrooms filled with the black kids she couldn’t lead. Other questions black male educators were grappling with were: How do I work within a system that I believe isn’t working for black children? How do I avoid the “invisible tax”? How do I advocate for black children without coming across as the “angry black man”? And, conversely, when is it OK, even extremely appropriate, to be that angry black man? Sessions at the annual Convening seek to address these questions and more. Our workshops are designed to show black men how to not take their skill set for granted, to codify exactly what they are doing to build relationships, and to challenge their supervisor to give them the time and space to professionally develop other teachers. With black men representing only 2 percent of the national teaching force, it would be easy to remain siloed and disjointed. However, our members have chosen a different path — a path that builds community, increases collaboration and healing, and, in the spirit of continuous improvement, pushes each other to become exemplary educators. The initial commitment of the founding members of The Fellowship — Black Male Educators for Social Justice was grounded in self-determination. We knew that not a single one of us had been encouraged to become teachers while we were in high school. We knew that if we wanted to help inspire a new generation of black male educators, we needed to help lead that work. So our first commitment, at zero cost, was to speak to our students about becoming teachers. Our “Why I Teach” tour, which focuses on students of color, was born from the idea that while many white women teachers heard very early on that people (especially their teachers) could envision them leading a classroom, very few black boys heard the same — even if they showed the same promise. We also recognized that we couldn’t wait for others to elevate the profession in our communities and highlight the importance of having mirrors of our students leading the classroom and schools. So we decided to consistently sound the alarm of having such an extreme imbalance in racial diversity and highlight positive images of black men leading classrooms and schools. At our convenings, we have high school and college students routinely participate, both as participants and as panelists. As David Johns, executive director of the National Black Justice Coalition, once told us, if we neglect to include students in our educational conferences, we are wholly missing the mark. Malcolm X said that “only a fool would allow their children to be educated by their enemies.” We have to consider the foundations of our public school system and its negative impact on black children. The results and outcomes that we have thus far are nothing short of a travesty and criminal; they can only be generated in places and systems where white supremacy, low expectations, and implicit (and explicit) biases reign supreme. So, while some call for an immediate and renewed student-facing desegregation effort, we are calling for the urgent work of desegregating the staff of our public schools as an important part of equity and justice. With a concerted undertaking, we can tell our students, help is on the way. Our Convenings help us to double down on these efforts as each attendee is challenged to implement something that they learned that will advance social and educational justice in their classrooms, schools, and communities. Sharif El-Mekki is the principal of Mastery Charter School–Shoemaker Campus, a neighborhood public charter school in Philadelphia that serves 750 students in grades 7-12. From 2013-2015, he was one of three principal ambassador fellows working on issues of education policy and practice with the U.S. Department of Education under Secretary Arne Duncan. He blogs at Philly’s 7th Ward and is a featured voice at Education Post.